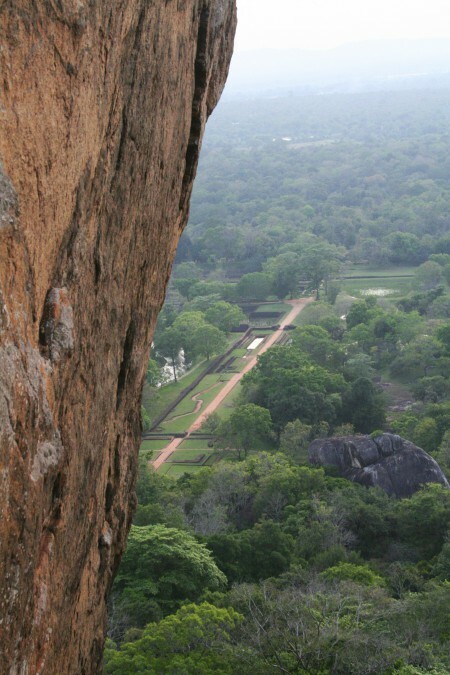 Located near the town of Dambulla, the Sigiriya lion rock is a palace complex built on an isolated rock that is about 200 meters tall. Archaeologists have found evidence to show that the rock had been inhabited during the prehistoric Mesolithic period. Until the 14th century this rock had been used as a monastery. 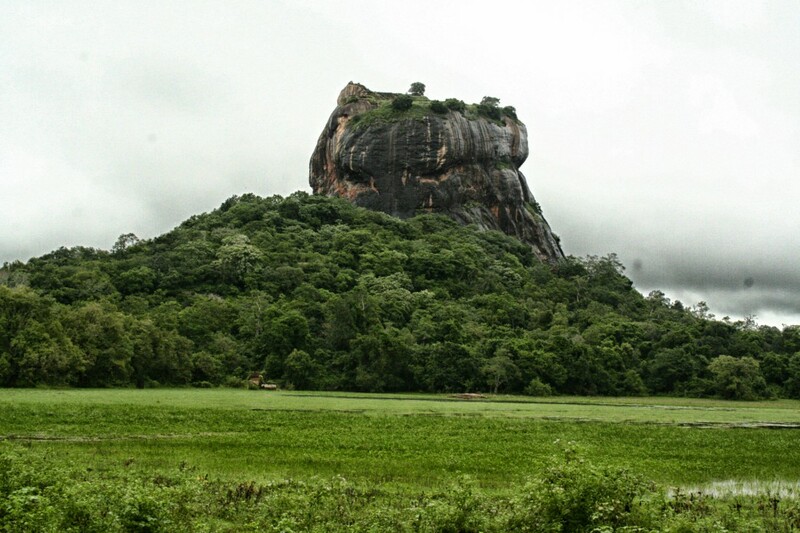 Legend has it that King Kashyapa after usurping the throne from his father built Sigiriya fortress to protect himself a possible attack from Prince Moggalana who was his half brother and the rightful heir to the throne. The view from up above rock that spreads a few kilometres and the strategically built moat that could be seen even today shows the visitors, the paranoid psyche of the King. The complex irrigation systems, the asymmetrical and symmetrical garden complexes, magnificent frescos and a mirror wall that is about 1000 years old indeed amaze even the modern architects. It is better to start climbing the rock early morning as the heat and sun tends to make the climb hectic. After ascending the steps carved on the rock itself you can see the paws of a lion carved in stone when you come to the plain terrain of the rock. Its designed to look as of the visitor is entering the rock through the mouth of a lion. Historical record tell us that it has been called “Singhagiri”; ‘singha’ means lion and ‘giri’ means rock. 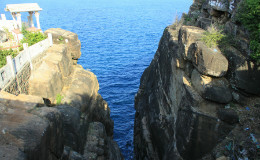 The most striking sight is the frescoes that you can see on the west side of the rock. About 500 maidens in these frescoes had been painted on a surface that is made out of clay but only 22 can be seen today. 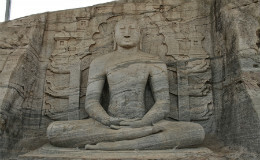 Historians say that the frescoes are similar to the paintings found in Ajantha caves in India but also the painting strokes bear a unique resemblance to the paintings of the Anuradhapura period. There are different theories regarding the maidens’ identity. Some historians suggest that they depict the harem of the King while others note that they are maidens participating in religious activities as they hold flowers in most of the paintings. The mirror wall near the spiral stairs that lead to the frescoes contain poetic verses that are written in ancient sinhalese about love nature. It is a masonry wall which has a meticulously polished white plaster surface and it even has verses that date back to the 8th century. 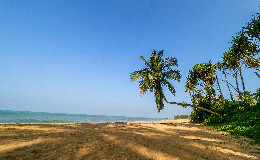 The gardens in the palace complex are considered one of the oldest surviving gardens of history and it is mainly of three different types which are connected to one another in this massive palace complex. 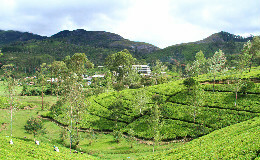 You could see the terraced gardens, watery gardens and the boulder gardens in the palace precinct even today. The irrigation systems that existed at that time are so developed that cisterns made out of rock had been found in the precinct. 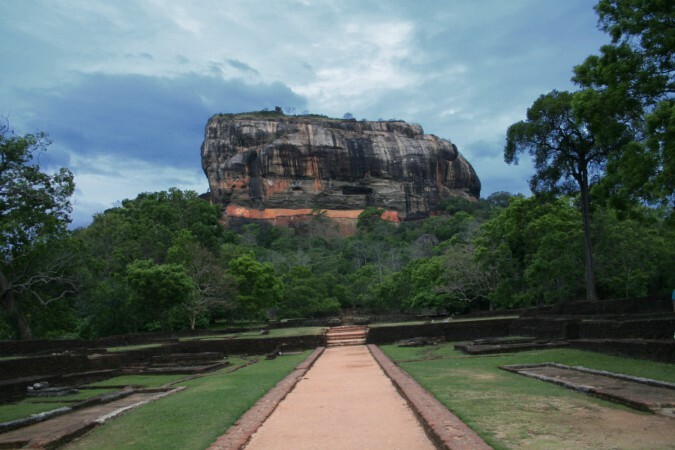 A visit to the Sigiriya lion rock will be worth your time and it will be an experience of a lifetime as you could witness an astounding historic testimony of a once highly developed civilization.